On 14 January 2019, the Collaboration for Sustainable Development of Viscose (CV) convened about 120 participants from the viscose, yarn, fashion, pulp, forestry and NGO sectors to a multi-stakeholder dialogue in Beijing. Spanning from China, Europe, Southeast Asia and USA, these participants were invited to exchange perspectives and recommendations for a sustainable viscose industry. · China is the world’s largest producer and consumer of paper products, and therefore needs to play a more important role in the sustainable development of forests. · Supply chain transparency is a necessary step towards transformation and sustainable change. · Forest sustainability depends on the support of regulations and certifications. It is recommended that enterprises ensure their wood-based raw materials are from sustainable sources through third-party certification and verification. · While WWFsupports FSC, it also recognizes different countries have different conditions where only one certification may not be sufficient. Companies have to evaluate accordingly before developing sourcing policy. · Certification is a tool; there are other means of verification and alternatives to support an inclusive approach to risk management and transformation including various certification standards, on the ground engagements, scientific methodologies and satellite-based tools. · Encourages CV members to be more pro-active in communicating the positive changes that have taken place since the launch of the CV Roadmap and continue to do so. · Encourages brands to adopt a change-transformation approach rather than a risk-management approach via elimination through understanding the real situations on the ground, for e.g. in Sumatra, the main deforestation driver is not companies but small farmers. · Traceability for viscose supply chain is becoming more important for the brands. · Provides an important baseline for CV to know the current sustainability performance and provide targeted guidance for improvement. · Would there be more precise reporting, including disclosing and rating performance of each member? o In CV’s engagement with brands, realise downstream does not really understand upstream. Recognize there is much room for improvement in reporting and disclosure; CV will continue to improve on this front. o CV will be launching its first Sustainability Reportin March 2019 which will provide some data on the performance of CV members. o CV needs to first understand how EU-BAT figures are arrived. We will also explain how we arrive at our standards limits, including methodologies. o CV has started working on our CV Roadmap 2025, and will conduct invite stakeholder in due course. Brand:How do you verify members’ performance – by 3rd party? o Certain technical indicators may require longer time period for verification, in particularly when benchmarking with the likes of EU-BAT which we currently do not have sufficient understanding of, especially on indicators relating to air emissions. Until CV gets more clarity on EU-BAT, we will focus on the Clean Production Standards (CPS). Brand:What is the position to use tools like HIGG? Oeko-Step? o CV has no preference for Higg over Oeko-Tex STeP, vice versa. Both are acceptable. Brands:Brands ask for sustainability point of contact for each viscose producer. Can CV provide? o CV deals with different topics and for each topic area there are different responsible personnel from each member company. Not every CV member has a dedicated sustainability personnel. 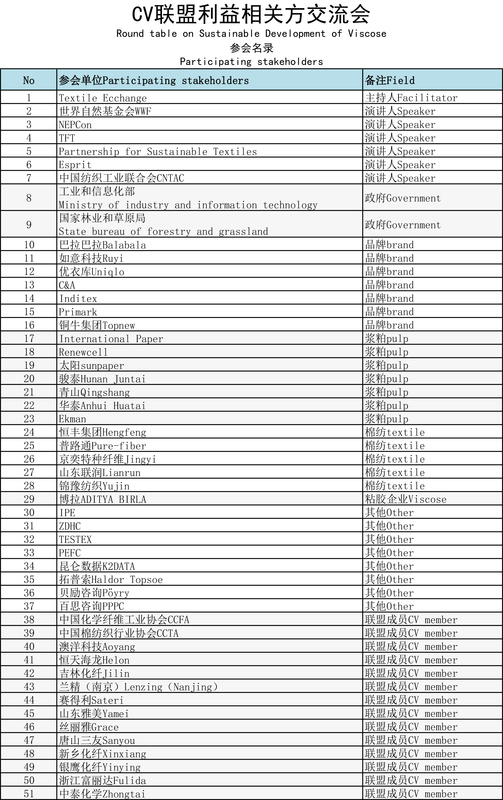 o We will send you the contact list after the meeting, but for above-mentioned reason, not all contacts listed here are sustainability personnel. Brands:Brands have developed a self-assessment survey for viscose producers; can CV get its members to do the survey? o Viscose producers already have to undertake a lot of audits, standards. Hope brands can simplify the process and not duplicate work for producers. o CV suggests that the survey can be standardized and promote more brand use it, which can reduce repetitive work. Brands: What is the difference between CV and EU-BAT standards? o Most of indicators are comparable. o Raw material and manufacturing are different. On manufacturing front, CV is working with ZDHC to see areas which can be improved, including discussing about EU-BAT. EU-BAT is astatic standard, what next after reaching those targets? It is not clear. o There are a lot of questions about EU-BAT that CV wanted to clarify and have asked CMF accordingly but received no response from them. Brands:Does CV’s 2025 roadmap aim to align with or supersedethe CMF roadmap? o Some members already outperform some of the CMF indicators. Need to understand how limits of other indicators are arrived in order to strive towards meeting those targets.